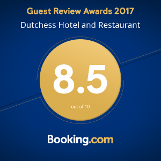 Dutchess hotel and restaurant is strategically located for many activities. You can easily spend a week in Fort Portal without getting bored. More details you can find in the list of activities in the area and an overview of the nearby national parks. All programs and suggestions listed below are not operated by Dutchess, but we are more than happy to help our hotel guests organizing their chosen trip. All payments are made directly to the local people and organizations. Start in the morning with a swamp walk in Bigodi (at midday it might be too hot). Have a luxury lunch at “Papaya Lake Lodge” or “Ndali Lodge” and enjoy the view on the crater lakes next to the swimming pool. Visit the chimpanzees in Kibale forest (either at 8AM or 2PM, permit needed). Did you like the monkeys at the crater lakes? Have a basic lunch at lake Nukaruba and see the groups of black and white Columbus or red tailed monkeys pass by. You can stretch your legs with a forest walk or a short hike to “The top of the World”. Day trip to Queen Elisabeth National Park. You leave in the morning at 6AM and will return at approximately 8PM. While be taken on 2 game drives you can enjoy the fantastic landscape and keep an eye out for lions, leopards, hippos, Ugandan kobs, elephants and many more. At either 2 or 3 PM in the afternoon, you will enjoy a boat trip on the Kazinga Channel within the park and will get very close to elephants, buffalos, hippos, crocodiles and many birds. First day to acclimatise. Rent a mountain bike and see the “Ambaara caves” and hike up to “Lake Saka”. Or go mountain biking in a crater lake area with a guide. See the chimpanzees in Kibale forest and in the afternoon do the swamp walk (or the other way around, depending on your permit). Lunch can be taken at the Primate lodge. Hike the Kyaninga area with Simon a good, local guide who knows a lot about the area and the many birds within. This can be done either on a half or full day. Walk in the crater lake area and climb the foothills of the Rwenzori Mountains. Explore the Semuliki valley and go to Semuliki National Park. Specially enjoy the view of the Rwenzori mountain while driving there. The view is even better than the geysers in the park. The lowland forest is unique and has unique birds to offer. Be prepared, it is on a 700 meter altitude. It can be hot. Visit “Rwenzori Founders” and see how they make bronze sculptures. After this take a dirt road to “Equator snow lodge”. Enjoy the feeling of the Rwenzori mountains when you have lunch at the last bit of civilization. Visit Ntoroko and drive through the Semuliki Nature reserve. Ntoroko is a small fishing village at lake Albert close to the border of Congo. Birds are plenty at dawn and dusk. The trip will take you through a Nature Reserve and you might see antilopes and baboons. If you really enjoy “off the beaten path” experiences than join the researches in the reserve to look for Chimpanzees. The search is here the adventure, finding them needs luck. Start in the morning with the swamp walk in Bigodi (at midday it might be too hot). Bigodi is a community project and supports the people in the area. Have a basic lunch at lake Nukaruba and see the groups of black and white Columbus or red tailed monkeys pass by. You can stretch your legs with a forest walk or a short hike to “The top of the World”. Go on a walk with Simon. 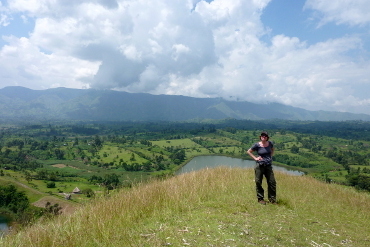 See the crater lakes near his home village and join an excellent local lunch at his family home. In the afternoon you can see how farming is done in the area. Many people benefit from your visit. The owners of the land you pass, the women who prepare the food and the farmers you visit. Visit Muguzu market (only on a Wednesday morning). The biggest local market in West Uganda. See where people by their vegetable, livestock, clothes and many others items. Have lunch and relax the afternoon at “Kluge’s Guest Farm”. See how they grow their crops or just enjoy the pool. Visit the botanical garden (North side). Get an explanation on how plants and trees are locally used. (This only half day). Take a local guide and get an explanation about the town, walk pass the post office, a school and visit the king's palace. (This only half day). Take a local guide and take a boda to Karambi Tombs, the burial grounds of the Royal family. You can also take a town walk and end at the Tombs. (This only half day). Visit “Rwenzori founders” and see how they make bronze sculptures. After this take a bad road to “Equator snow lodge”. Feel the Rwenzori mountains when you have lunch at the last bit of civilization. We can arrange transport for you. A pickup from Entebbe Airport to Dutchess Hotel in Fort Portal (360 km) can be organised. Local transport to the listed activities and national parks. If you rather drive a car yourself then Roadtrip Uganda offers excellent deals on the rental of small and large 4WD. For more information and booking see the Website of Roadtrip Uganda.